Thursday 28 July 2:00 p.m. – 9:00 p.m.
Friday 29 July 10:00 a.m. – 12:00 a.m.
Saturday 30 July 10:00 a.m. – 12:00 a.m.
Thursday 28 July 2:00 p.m. – 12:00 a.m.
Friday 29 July 10:00 a.m. – 4:00 a.m.
Saturday 30 July 10:00 a.m. – 4:00 a.m.
Thursday 28 July 2:00 p.m. – 8:00 p.m.
Friday 29 July 10:00 a.m. – 8:00 p.m.
Saturday 30 July 10:00 a.m. – 8:00 p.m.
Thursday 28 July 3:00 p.m. – 2:00 a.m.
Friday 29 July 10:30 a.m. – 5:00 a.m.
Saturday 30 July 10:30 a.m. – 5:00 a.m.
Sunday 31 July 00.00 a.m. – 8:00 a.m.
Vesec is situated 390 – 452 meters above sea level south of Liberec, in the cadastral district of an area of 469 acres. Geologically, it is a part of Jizera Mountains. Vesec is one of the oldest villages of today’s Liberec territory. The first written mention of the village comes from the year 1412. It was given the name Víska on 1893 and renamed to Vesec in 1923. The village is situated in the border region that was annexed by Nazi Germany on 30 September 1938 after the Munich Agreement was signed. From 25 March 1939 until the year 1945, this annexed territory was called the Reichsgau Sudetenland and Vesec was given the German name Dörfel. 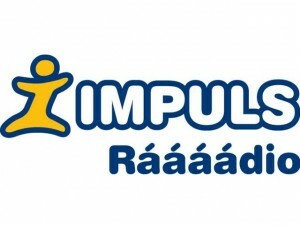 Its name means a small village. The Lusatian Nisa River running through the village forms the border with the adjacent villages Vratislavice and Rochlice. On its tributary called the White Creek is the Teichmühle Lake. The Nisa River’s another tributary, the Border Creek, springs in the Šimonovice cadaster and separates Vesec from Šimonovice, Minkovice, Pilínkov, Doubí and Rochlice. 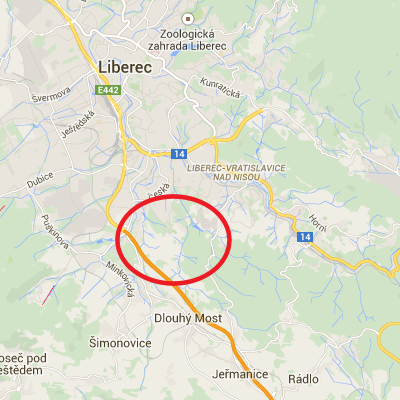 The creek’s name comes from the fact that it created the border between the Český Dub domain and the Liberec domain. Vesec was a part of Waldstein’s Český Dub domain. In 1624, Vesec and other six villages (Dlouhý Most, Jeřmanice, Javorník, Šimonovice, the left-bank part of Vratislavice and Záskalí) became a part of the Siebendörfel fiefdom. 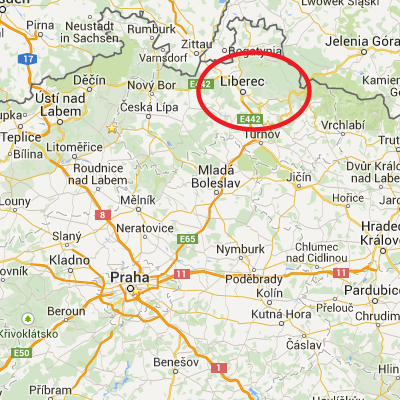 In 1850, Vesec was included in the county office of Liberec, the Liberec circuit. On 29 April 1909, Vesec became a township. The year of Vesec’s foundation is unknown. Vesec had been an independent village up until 1 May 1976 when it was annexed by Liberec as its 25th district. The new modern premises were built from nothing in the Vesec district of Liberec. They mostly hosted international sports events. The premises are located in the natural setting of the Lusatian Mountains where you can hike /e.g. to Milíře, Císařský kámen, Ještěd/ and swim in the Taich Lake nearby. The premises are currently used a lot during summer months for various sports and cultural events.